When the Grey Cup enters a room for a public function, it's usually a very big deal and that's why it's appearance is almost always shadowed by an accompanying colour guard of impressive men or women in uniform of some description. 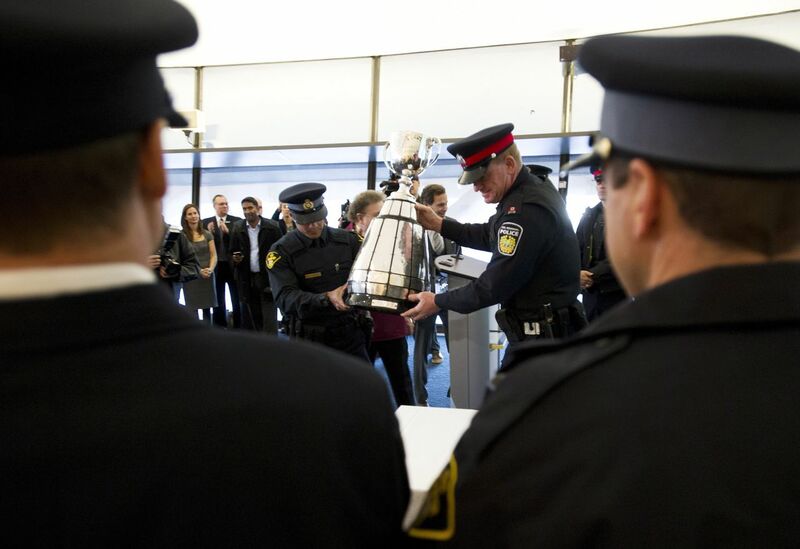 When the grand old mug was ushered in to Toronto's city council chambers on Friday to help officially launch the festivities of the 100th Grey Cup Game, a line of seven police officers and two fire fighters stood dutifully behind it. All nine with something more in common than just the opportunity to appear in full dress and smile for the cameras as the dignitaries took to the podium. All nine invited on this day are former CFL players with more than a dozen Grey Cup rings between them. They're not the only ones who might have been at the reception. "There are lots more we could have invited," a CFL spokesperson said. Lots more. 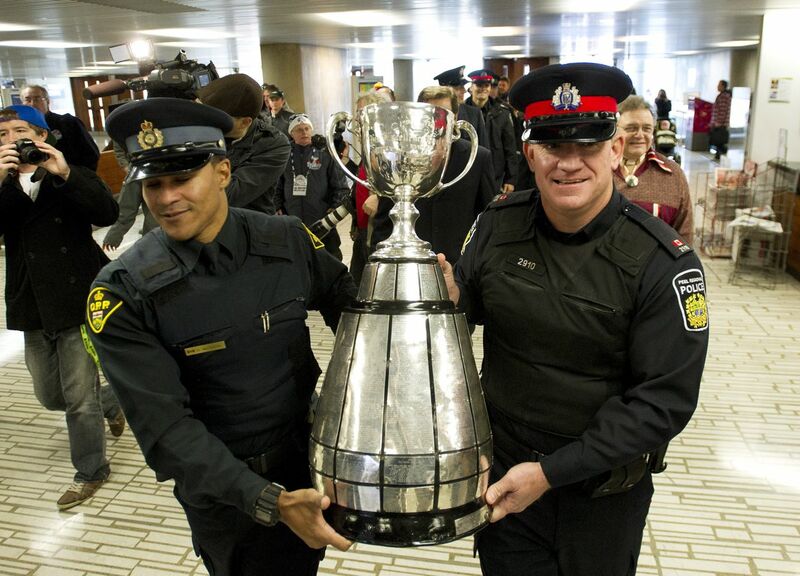 Makes you wonder what it is about life as a pro football player might that leads so many of these past Grey Cup champions to step into a second career, this time as a protector of the public well-being. "Number one, I think it's a team atmosphere," said Kelly Wiltshire, a Grey Cup winner in 1997 with Toronto and then Edmonton in 2005. "A common goal achieved by many who come together. And number two, I think it's still being part of a community. As a player, you're going to be involved and go out and do appearances and you play for the fans. When you're a fire fighter or a police officer you're serving that same community that you played for. Those things come together real well. Wiltshire is now a constable with the Ontario Provincial Police. Sitting at a table a few feet away from the Cup, we are joined by two other former CFL players who've found some commonalities between playing professional football and facing the dangers that are often present in their chosen line of post gridiron employment. 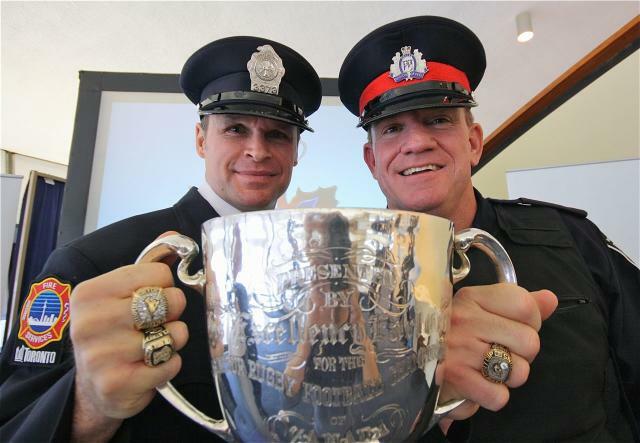 Lee Knight, a Cup champ in 1986 with the Hamilton Ticats, is now a constable with Peel Regional Police. He is a member of the Ticat Walk of Fame, having played all eleven of his CFL seasons in black and gold. Paul Clatney won three Cups in his career, with three different teams; the Ticats (1986), Winnipeg Blue Bombers (1988) and the Calgary Stampeders (1992). Now, for the City of Toronto Fire Department, he runs toward danger the way he used to zero in on kick returners throughout his seven year CFL career. "For me, athletics has been my life," said Clatney, building on Wiltshire's thought. "Sports, since I was two or three years old was what I wanted to do. This job is as close as I can find to playing sports. When we get a fire call, it's like I'm running down on a kick off. It's the adrenaline through my veins and away we go and let's get 'er done. So, in some ways, I'm still running down on a kick off," he said. "There are moments when the adrenaline rush is unbelievable," said Knight, nodding in agreement. There are obvious differences between the kind of adrenaline rush a football player would feel in a big moment during a game as opposed to the kind he'd feel when a dangerous suspect needs apprehending, or when getting ready to charge into a burning building. "In our line of work, as police officers, it's about going home at the end of the day," said Knight, in matter of fact fashion. To that end, you might wonder if football's dedication to discipline and teamwork helped prepare these men for what lay ahead. Winning a championship may compare in some superficial way. Whether it's hoisting the Grey Cup, or the much more serious goal of a police officer or fire fighter going home at the end of the day, relying on others is paramount. "The team environment is the biggest part of police work, there's no doubt about it," said Knight. "Similar to policing it can be a matter of life and death," explained Clatney, of the need to trust your fire fighting mates. "It's everyone working together. You're only as strong as your weakest link. Yeah, it's teamwork and getting the job done. You rely on your teammates big time." The pro sports landscape is, unfortunately, more than lightly littered with former athletes who have found the transition to the "real" world a frightening challenge. Some do slide easily into their new existence. Others struggle with a new world that is vastly different from the cloistered and tightly knit team atmosphere they come from. For Wiltshire, that same team atmosphere found in police work seemed a natural fit, especially since he can do a little "coaching" at the police academy. "I get to instruct and still be a police officer, and work out and do all those things, and it's as close as it was (in football). You know, you put your uniform on, there's guys doing pranks and all those things. Nothing changes. Except, you're carrying a gun this time," he said, seriously. "When you're a kid you want to be a superhero or a cop," Wiltshire continued. "You can put your life on the line for a stranger you do not know. That's the kind of heroic part that drew me to this. After my first dream job, which was playing football, I now get to do another dream job. So, to me, it's pretty lucky." Football fans know that in a locker room filled with egos, there are vital ingredients necessary to ensure that the collective can be more than the sum of its parts. Humour is one of those ingredients. Knight, Clatney and Wiltshire assure that the kind of healthy pranksterism and light-heartedness that run amok behind closed doors in sports are present at a police or fire station. "There's all kinds of characters," began Clatney. "I'm in a three-truck hall, so we've got 12 guys. All different types in there. So, I've still got my dressing room. People ask me 'do you miss the game a lot?' When I watch a game, I don't feel like going out there and playing. My body's had enough of that. But, I still have my dressing room camaraderie with the guys at the fire hall." "The guys who are in different jobs and businesses, they miss the camaraderie," offered Wiltshire. "And we still have that. So, I don't miss the game. I can honestly say I've left it behind. I was saturated with it, played at a high level as all of the guys here did. You don't want to tackle people every day, for obvious reasons. But, you get your opportunities (in policing) and I think the physical side of the job is also interesting." The physical side. All three of these men spent a rather large amount of time colliding with others during their football careers. Wiltshire made 609 career tackles over the course of his 10 years as a linebacker and defensive back. Clatney still holds a piece of a CFL record - an incredible 7 special teams tackles in one game. Knight was a slotback who also ran out of the backfield a time or two. He also regularly ran his lanes on special teams in search of returners to take down. When asked if tackling skills ever came in handy in their second careers, there are smirks all around. Knight, in particular sees the humour in one of his foot chase tales. "I had an incident one time where I was chasing a guy through a field," he recounts. "It just happened to be a football field (laughter all around). When it came up that I needed to advise, on my radio, that I was chasing this guy I said 'he's running back of the school and he's running across a football field!' Well, everybody who received that, they put two and two together and they got a good chuckle out of that." Asked where he made the tackle, Knight chuckles and responds that "It was about midfield." "First day on the job," he said. "I wind up chasing the guy and taking him down. Only thing was, there were no commentators and I was waiting for someone to say 'Wiltshire on the tackle!' So, I missed that part of it." Clatney doesn't ordinarily have cause to tackle any perps. But he can see some physical similarities between football and fire fighting. "My first working call for a fire, I had to bust a door down. So, busting a wall out there on a kick off... busting a door down... yeah. It's a physical job and a lot of similarities to what we did on the field." Every year, another crop of newly retired football players begin their search for what's next. Knight says it's not rare for someone to reach out to him. "It's not for everybody, obviously," he says of policing." But I do get the occasional call from somebody who says they're thinking about it. I highly recommend it." "Most would do well," adds Wiltshire. "It's something they should definitely consider. Football guys are well-trained. And it's one of four major sports where you have to go to university to play (professionally, afterward). So, you get well-rounded individuals. These guys fit right in." Food for thought for the CFL stars of 2012 as they continue their quest to lift the trophy that Clatney, Knight and Wiltshire have already hoisted. A trophy that they helped to ceremoniously deliver as the 100th Grey Cup Festival begins. Their uniforms are now different. What seems to remain the same, what seems to have transcended to their second careers, is a sense of team and of dedication. We keep hearing that football is a great test of character. The men who brought the Grey Cup to Toronto would, undoubtedly, agree.